Valid points and a great question to ponder. You may recall my quote from Benjamin Franklin: "Waste not, want not". Add to that a quote from the Sierra Club: "Energy use should be minimized through conservation and efficiency. In the near future, efficiency is the only "energy source" which does not incur some environmental damage and which is available immediately in generous supply. Sophisticated building construction, efficient appliances, recycling, modernized industrial processes, programmable thermostats, public transit supplemented by fuel-efficient cars, and many other innovative technologies can reduce energy use tremendously, while saving money." I thought you all might find this power point article interesting. It was sent to me by a group representing local small farmers who are looking into growing bio-crops for economic opportunities to feed their families. The information below is from the power point presentation. © BrokenSphere / Wikimedia Commons. Thanks so much for sharing this and for your continued strong support of our client's green renewable energy project. In addition to assisting the country in reducing our consumption of middle eastern fuel and improving the environment, this project will provide a much needed economic impact for landowners of every race, and the Industrial Authority will assist in the efforts underway to assist local farmers. Google "benefits of biomass electricity,"
"Like a burned-over longleaf pine, we can come back from this recession greener than ever, if we choose wisely." It's an opportunity for those of us who are not currently searching for our next meal to help those who need jobs, and thereby to help ourselves, so they don't turn to crime. 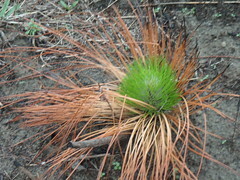 Like a burned-over longleaf pine, we can come back from this recession greener than ever, if we choose wisely. 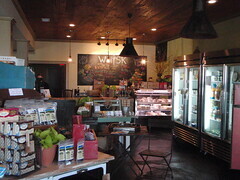 Not just strictly organic by Georgia's ridiculously restrictive standards for that, but also less pesticides for healthier foods, pioneered as nearby as Tifton. That's two markets: one for farmers, stores, and farmers' markets in growing and distributing healthy food, and one for local banks in financing farmers converting from their overlarge pesticide spraying machinery to plows and cultivators. Economic development is a high priority on the mind of many people. If you read the local paper you will see page after page of foreclosures, failing businesses, and unemployment at a all time high. Please explain to me how we can address these problems through energy needs? Grow crops to burn for fuel, or for food? Valdosta City Council member James Wright brings up an article about farmers growing plants for biomass fuel. These things get passed around by council members, and I'm pretty sure this one that came to me indirectly is it: November 12, 2010 - Incentivizing Renewable Biomass Production, by New Energy Farms, Leamington, Ontario. What they're mainly recommending is Miscanthus, which is a genus of clump grass. After all the citizens left --Valdosta City Council, 20 Jan 2011.